Touring Manali in Himachal Pradesh is not the only thing to be done while planning for a long summer vacation in this state, renowned for popular hill stations. The natural appeal of Nature is bound to enchant tourists and adventurers but it still is a tough decision to go motor biking in Himachal, if not prepared. The capital city of the state, Shimla is like first and final destination for those who are not really acquainted with the place. Once done with the first meeting, time to know it closer while making newer acquaintances, as in roads, motor bikes and the other places nearby as well as those that are at some distance from Shimla. Motor biking is the best way to do just that. 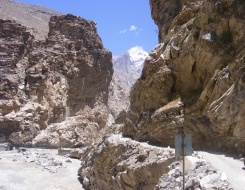 The journey would take the rider through towns of Sarahan, Sangla Valley and Manali, which are interspersed by lakes like Nako and Chandertal, mountain passes like Kunzam and Rohtang, monasteries of Tabo and Ki and many other experience worthy minor destinations. For a better understanding of the route, consult the below given itinerary. In the morning meet Peak Adventure Tour expert; briefing about the trip and then drive to Chandigarh via Karnal & Ambala. On arrival check in to hotel. In the evening meet our bike expert and take a test ride near by the hotel. Overnight stay in hotel. In the morning after breakfast start your motor bike safari tour to Shimla via Kalka & Solan. On arrival check in to hotel. Overnight stay at the hotel. Today is a gentle ride through stunning greenery, smooth roads and mountains and today will give you time to get used to riding your bike and taking in the scenery around you. Sarahan is a charming beautiful hill-village and our stay here is complimented by the surrounding views. On arrival, check in to the hotel. Visit the Ki monastery and Kibber village. Overnight in guest house. Travel to Manali via Kunzum Pass & Gramphu & Rohtang Pass. The drive provides you with some spectacular views of the rugged Spiti valley, CB ranges and Barashigri Glacier. Overnight in hotel. In the morning after breakfast get ready for the last day riding toward Chandigarh via a beautiful valley of Kullu. Overnight stay at hotel in Chandigarh. After breakfast transfer to Delhi by car. Trips & Services Ends Here. • Accommodation: Hotel at Chandigarh, Shimla, Manali & guest house/tents/home stay at Sarhan, Sangla, Nako, Tabo, Kaza on twin sharing basis. • Transport: From Delhi – Chandigarh & back by AC Toyota Innova. Also we will take support vehicle throughout the tour. • Royal Enfield 350 cc/500 cc. The fuel will be fulled by the rider. • Meal: At Chandigarh, Shimla, Keylong & Manali only breakfast will serve and rest of the places all meal will be provided. Meal will be mix of Indian, Chinese & continental. Cook will accompany the group. Note: The helmet, gloves and other personal equipments may kindly bring your own.